Everywhere we go there are signs pointing us in the right direction. We have symbol-based signs for airports, parking lots, handicapped parking spots, and many more types of locations. 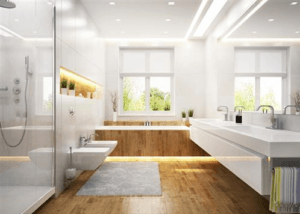 Perhaps the most famous of these pictorial signs are the men’s and women’s signs that adorn bathrooms around the world, that tell members of each gender which restroom has been set aside for them. These kinds of signs are so prevalent in our lives, we often take them for granted. How did we decide what symbols to use for men’s and women’s bathrooms, or that we would even use symbols at all? Turns out, modern pictorial signs can be traced back to isotype, a universal graphic language that was developed in the 1920s. Isotype is the shortened version of International System of Typographic Picture Education, a type of symbolic picture language that was developed in the 1920s. Isotype was created to be a universal graphic language that would cross all language and literacy barriers, allowing people of all races, classes, and backgrounds to share ideas equally. Isotype was originally created by Otto Neurath, a Viennese philosopher. In the early 1920s, Neurath and his wife Marie founded the Isotype Institute. The Neurath’s recruited many designers to join the Institute, with the mission of creating a universal graphic language. Together, the Isotype Institute team worked to develop a series of symbols that could represent large, abstract ideas, but which could be created with just a few strokes of a pen and would be comprehensible even to schoolchildren. For Neurath, isotype was a way to put his Modernist and socialist ideas of universal equality into practice. In the mind of its creators, isotype would improve working conditions, healthcare, and all other aspects of daily life for working people, regardless of education. Unfortunately for Neurath, mainland Europe was quickly becoming an unfriendly place for a man with his outspoken egalitarian ideals (not to mention his Jewish heritage). The Isotype Institute was forced to relocate multiple times, first to the Netherlands, and then to England. The Institute would stay in England after the war, where it would continue to operate until 1971. Despite the fact he was twice forced to flee his home, Neurath’s ideas proved to be very influential. The United States, the USSR, and even governments in West Africa all saw potential in the Isotype Institute’s ideas, and set up bodies to pursue similar research. In 1974, the U.S. Department of Transportation hired design firm Cook and Shanosky Associates to create 50 “passenger/pedestrian” symbols, which eventually expanded into the modern pictographic signs used today for first aid, telephone, and the series of “wayfinding” icons still used in public spaces, including the men’s and women’s bathroom symbols. 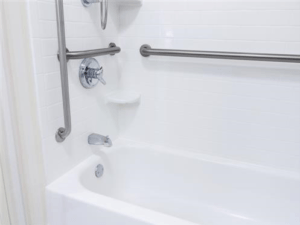 American Bath Enterprises specializes in ADA-compliant baths and shower stalls. To learn more, contact us today at 888-228-4925.